Students from the University of Illinois at Urbana Champaign have developed one of the first 3D-printed prosthetic hands with the ability to recognize patterns. 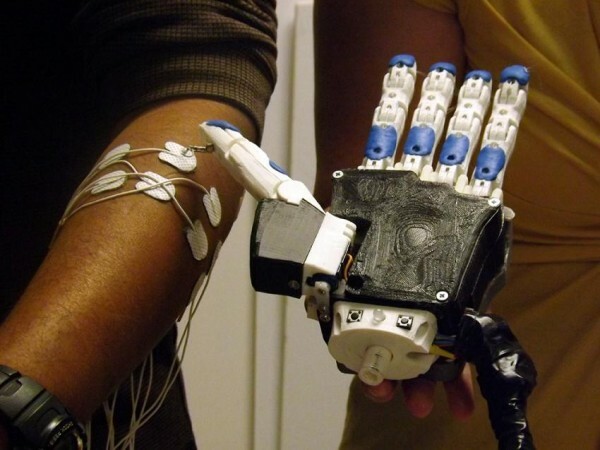 A machine-learning algorithm lets the hand do more than just close and open. The hand can learn other possible positions for more functionality. Just as importantly, it's relatively cheap to make at only US$270. The common myoelectric prosthetic limb retails for US$30,000 to US$40,000, making the 3D-printed prosthetic 111 times cheaper than the cheapest limb in the market with the same capabilities. "Using the machine-learning algorithm based off the signals it picks up from the muscles, it can figure out which of these grips he is actually doing," explained team leader Aadeel Akhtar, an MD/PhD candidate in neuroscience from the College of Medicine at Illinois. "The microcontroller with the machine-learning algorithm will then replicate the grip he's trying to make. Based on those signals, it sends commands to motor drivers, which churn the motor and make the hand move." While the EMG board currently being used for the present prototype is just as big as a common audio mixing board, advances in technology will gradually shrink it to a size that can fit inside the device. The team has encoded five mathematical models of actions: at-rest, a fine pinch, open-faced, closed and a three-finger grasp. Training a user to use the prosthetic limb only takes a minute or two and requires the patient to do all five gestures. Akhtar and Mary Nguyen, a master's student in aerospace engineering, traveled to South America in August and put their most recent device, an open-source dexterous artificial hand, through a trial by fire with an Ecuadorian man.